MSNBC had a crew in Texas covering the upcoming election. Reporter Mariana Atencio and her crew stopped by an early voting precinct and found the parking lot packed and a lot of people waiting in line to vote. The crew decided to park their live truck in the handicap parking spot and when a couple of people that needed disabled parking show up, they were not happy. Unlike others, Atencio realized what she and the crew did was wrong, and even took to social media to say she was sorry. 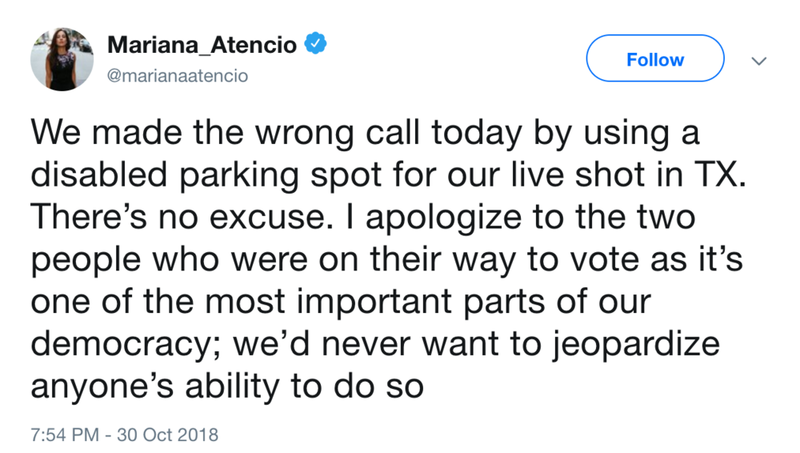 The MSNBC crew was wrong for parking in the spot, but at least they admitted they were wrong. Hopefully, they also learned from their mistake.